Oops - we don't appear to have a video for the ScanJet 8270. 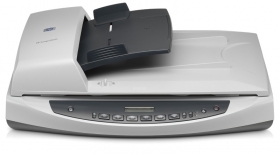 The HP Scanjet 8200 provides fast, professional quality photo scanning at 4800 dpi resolution. Combine this with the built-in Transparent Materials Adapter (TMA) and bundled software and you have the ultimate digital imaging package. Versatile solution – do everything from photo scanning to high speed document capture. The world's first flatbed scanner series to offer 4800 dpi resolution. Crystal clear results with rich, bright and accurate colours. Includes Adobe® Photoshop® Elements 2.0 for professional image editing. Professional quality scanning for clear, accurate results from documents, graphics and photos. High speed performance for real productivity – instant-on ‘no warm-up’ scanning and 4 second previews. Intuitive one-touch buttons including scan picture / document, edit text (OCR), copy, email and save to PDF, plus custom configuration options. Flexible platform – easily upgradeable to meet changing business needs. Real versatility – slim, stylish lid incorporates Transparent Materials Adapter (TMA).